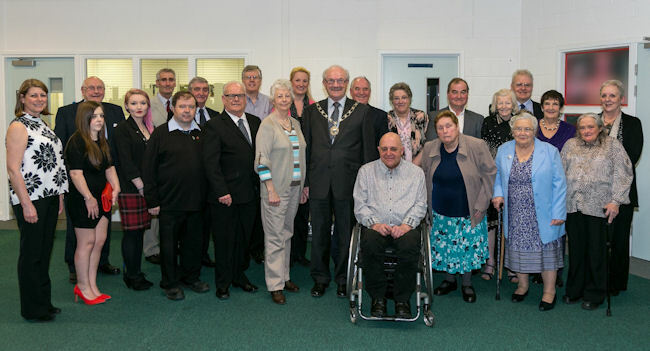 Nearly thirty unsung heroes and their families attended the Chair’s Community Awards at South Gloucestershire and Stroud College’s WISE Campus on Thursday 12 March. The annual awards recognise the outstanding contribution South Gloucestershire residents make to their local communities. These people give up their time freely to help others and bring our communities together, and were rewarded for their efforts at a special ceremony. Chair of South Gloucestershire Council, Cllr Howard Gawler attended along with the Lord Lieutenant of Gloucestershire Dame Janet Trotter and Vice Lord Lieutenant Robert Bernays, Principal and Chief Executive of South Gloucestershire & Stroud College Kevin Hamblin and Vice Principal Sara-Jane Watkins. Throughout the evening award winners from a wide variety of backgrounds were presented with their certificates by Cllr Howard Gawler and Sara-Jane Watkins. The final round was the Lord Lieutenant’s Special Award, which saw Dame Janet Trotter and Robert Bernays present £100 to Mike Spence for his valued services to Manorbrook Primary School in South Gloucestershire. Wheelchair user Mike is an inspirational role model volunteering both as a governor and as a teaching assistant at Manorbrook Primary School in Thornbury for over 15 years. Mike was instrumental in founding the Manorbrook Out of School Club, a care facility for the children of working parents and also helped the school achieve its ‘Healthy Schools’ status. Mike previously coordinated the netball events for the South Gloucestershire Festival of Youth Sport and volunteered as an assistant coach for the junior county netball squad. Our annual awards event is sponsored by South Gloucestershire & Stroud College and offers the perfect opportunity to celebrate the hard work and dedication of volunteers in the community who display outstanding commitment in giving up their time and effort to help others. Over 400 people have received an award since the scheme started in 2003. The evening also featured performances by Musical Theatre students from the South West Academy of Dramatic Arts, which is based at South Gloucestershire & Stroud College.